After four years, the Brick Bay Folly Project 2018 has delivered a fresh take on a folly with the recently completed ‘Jonah’. 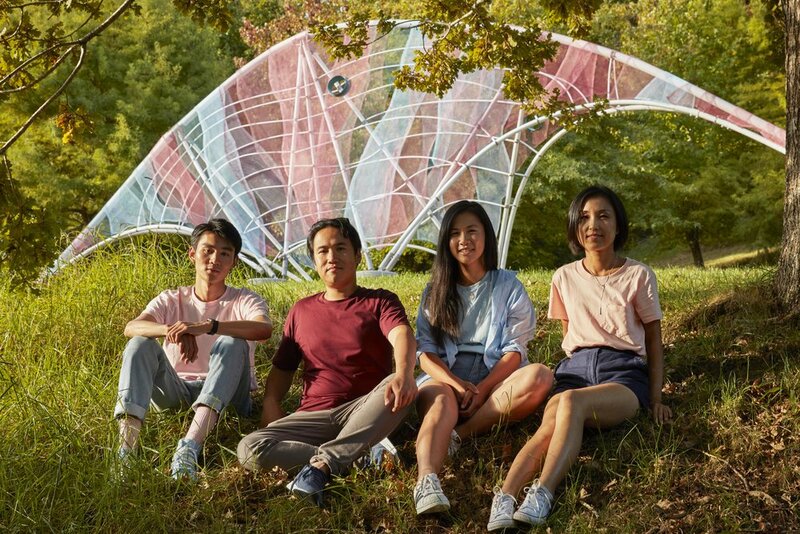 The 2018 winning team of Norman Ning Wei (Moller Architects), Cynthia Yuan (MPM Projects), Kim Huynh (Paterson Architectural Collective) and Kevin Kun Ding (Open Media Lab) all met at Auckland University while studying architecture. Fast forward a couple of years and an entry into the Brick Bay Folly competition! After reconnecting and throwing some ideas around at an Auckland café, the inspiration behind ‘Jonah’ was born. The team put together a proposal and submitted it for judging in October 2017 then waited to find out if they had made the top five. Anticipation gave way to excitement and hours of planning, sourcing and testing with the news that team ‘Jonah’ would be converting their concept into reality. Each year the bar is raised as, young and emerging New Zealand architects and students explore the intersection between architecture and sculpture, and the overlaps in reference, concept and technique between the two disciplines. The philosophy of the Brick Bay Folly project is to support new talent and challenge them to actually produce their creations. The winning entry receives a $35,000 grant towards realising their proposed project, and support comes from long term sponsors Resene, Fletcher Building, Brick Bay, Sam Hartnett Photography, Architecture New Zealand, Architecture Now and the New Zealand Institute of Architects. Christine Didsbury, Folly Judge and Trustee of the Brick Bay Sculpture Trail explains, “A Folly is an architectural object that lacks a deliberate functional purpose which must instead examine its surroundings and allow them to bring it into existence”. Cynthia Yuan of team ‘Jonah’ continues, “our creation is stranded alongside one of the beautiful lakes at Brick Bay and together with the seaside location of the North Auckland East Coast is reminiscent of the biblical story of Jonah, in which the prophet temporarily dwells inside a whale and received shelter from turmoil”. The structure references an abstracted giant sea creature, stranded on land, prone to the conditions of weathering and eventual exposure of its skeletal form. Adhering to the traditions of a folly, although like a building, it provides no practical protection, only offering spatial definition. Visitors are invited to occupy this semi-sheltered enclosure and perhaps imagine being inside the belly of a stranded whale. A large cantilevered arch or nose, trembles lightly in the wind, suggesting characteristics of living creatures and the transience of flesh, while colourful, translucent mesh ‘skin’ offers an interface between the visitor and the surroundings. Experimenting with non-traditional materials for the project, using PE piping for structural elements, the fabrication of this Folly was a journey of research and continual prototyping to create a lightweight construction where tension is paramount, to achieve a unique and elegant aesthetic. ‘Jonah’ was officially opened with a celebration held at Brick Bay in May when the team’s family, friends, tutors, and employers all came together, along with sponsors and the Brick Bay team, to revel in this achievement.